My friends! How are things? I hope that you had a great month of March and that you weren't pranked on too hard for April fools. What an interesting holiday/celebration. I've never been too good at pranking people. I do remember when I was in middle school I used to think that 'April fools day' was such an important, special time of the year but now that I'm older I see that, yep, it still is :) - just as long as I'm not getting pranked. Thank you so much for your support and partnership with me in our ministry. We had our first meeting with the incoming apprentices last week and I get to serve as a fundraising coach to them as they enter the fundraising season for the first time! Many of my coaching insights come from the things I've learned from you all over the years as you've been such a great partnership team to me as my time as a campus missionary. I'm honored and humbled to get to encourage our new incoming staff to be bold and faithful as they trust that God will provide for them generous donors like you all who believe in our mission to make and mature disciples for God's glory on his college campuses. A typical evening of our "Thursday Night Thunder" meetings at Richland College! One of my best buds, Kurt Doty, and I got to serve one of our FOCUS alum (who is an elementary school teacher) prepare a track for her choir! I greatly enjoyed it! After one of our Thursday Night Thunder meetings, a student expressed that his family is going through a difficult time so we gathered around him to lay hands on him and pray over his current situation. A view from the back of our Thursday Night Thunder meetings! This was something that was so encouraging! I went to my first ever FOCUS Alumni Night! It was a great time to re-connect with past FOCUS members who I knew as a student and celebrate what God has been doing since the time we graduated. I loved getting to be with them. It felt like a mini-reunion and definitely was an encouraging evening! We had our FOCUS Spring Showcase last weekend to help raise funds for SICM (Student Institute of Campus Ministry) and it was a blast! On stage in this photo is Valentin & Reni - both students in our Richland FOCUS ministry! They are both extremely talented vocalists and both vital parts of our Richland ministry. So thankful for them! Our Richland FOCUS Wednesday 1:30pm core! They have been so faithful and consistent with showing up each week to grow in their relationship with God together! Thank you all so much for believing in me and supporting our mission to make and mature disciples for God's glory. As summer approaches, I look forward to reconnecting with you all hearing about all the great things God has been doing in your lives. Please don't hesitate to contact me if you have anything in your life that you'd like prayer for. 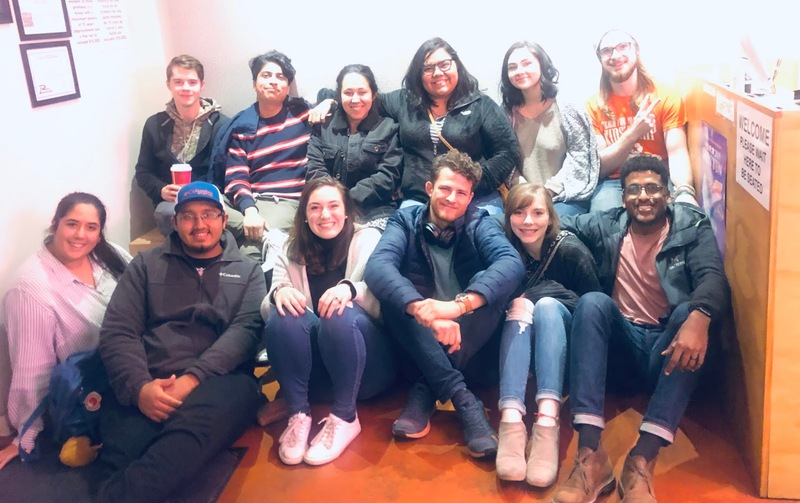 Your support means so much to me :) Thank you for being there side-by-side with me on campus as we change the lives of countless college students. I hope that you all had a great February and that your 2019 is off to a great start! February was a fun month that really encouraged me and reminded me of God's faithfulness and providence. Our Thursday night Richland fellowship meetings are off to a great start and we have such a positive group of students that come to our meetings. It's exciting and fun to see just how God has been changing & shaping the campus over the last few years and I'm just honored to be a part of it. Please be in prayer for our group as we think about what the future holds for our ministry @ Richland College. We have several students that will be transferring this fall and we are in the process of raising up new leaders to take their spot for next year. Campus ministry at community colleges can be challenging in some ways but also extremely rewarding in others! Please be praying for us as we prepare for the summer & fall! 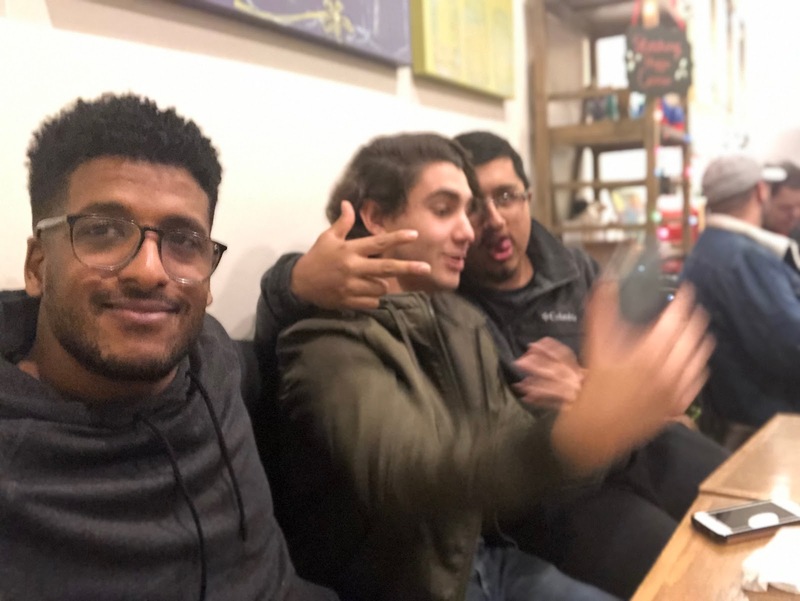 I hope that these photos encourage you and remind you that your support and partnership is going a long way in paving the way for students to be discipled on God's college campuses. Thank you for believing in me all of these years and walking side-by-side with me! Enjoy the photos below for my February 2019 update! Our Richland Thursday Night Thunder! So thankful for these students that are a part of what God is doing on campus! Our Wednesday, 1:30pm core! These guys have made the core time valuable and many students are growing in their relationship with God! Thank you so much for your support of our FOCUS ministry! Please be in prayer for our Thursday Night Thunder group of students! They are so excited to be a part of our ministry and get to love & serve one another! Please be praying for our Thursday Night Thunder group of students! They have all been so encouraging and welcoming to each other. I appreciate the way that they come to TNT with open hearts & minds, ready to engage each other w/ the gospel! Sandra, one of our FOCUS staff did such a great job preaching @ Thursday Night Thunder last week! It was great and very encouraging. She preached on living out your faith with courage and bravery! So good! I appreciate the way many of you have been praying for our ministry and loving us in such a Christlike way. I'm blown away that I get to serve college students alongside your support & partnership. I am grateful for your hearts and commitment to seeing Christ's name made known and his message spread from generation to generation. Please be in prayer for our Richland FOCUS leadership team. We've had some leadership transitions and we are praying for the next group of student leaders that God is currently preparing to step up and serve the campus! Thank you so much for your support and please don't hesitate to contact me if you ever have any questions, comments, or prayer requests! It's crazy to think that January 2019 is already almost over! 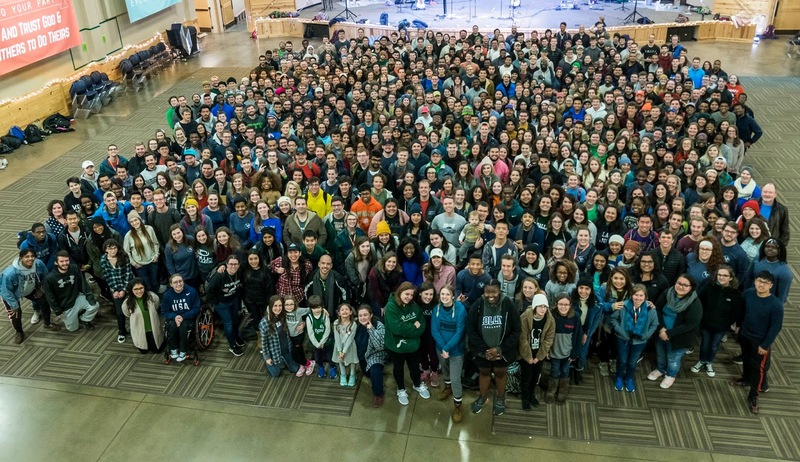 I'm blown away at how much fun our FOCUS Wintercamp was and how many students came. I am thankful that so many of you have been in prayer for us as a ministry in preparing for another wonderful spring semester. This year for Wintercamp, we brought in Dr. John Stackhouse to speak with our students. Dr. Stackhouse is a professor who used to teach at Regent College and is a Canadian biblical scholar and writer. He spoke with our students on how they can confront the culture of their time & space while still maintaining Christian values and positions. He was very thought-provoking, insightful, and funny! I am grateful to the countless men & women across our globe who have done the difficult work of scholarship and reading to help all of us who follow Jesus to better grasp the gospel. Many of our students are faced with decisions every day about how to interact with culture, ideas, and what their response should be. Often, it can be easy to dismiss it all and take a backseat to it all but Dr. Stackhouse did a great job at equipping and encouraging the students to step up and engage with the culture around them. I hope that the pictures below are encouraging and a great reminder showing us what God is doing this semester! Thank you for your support! 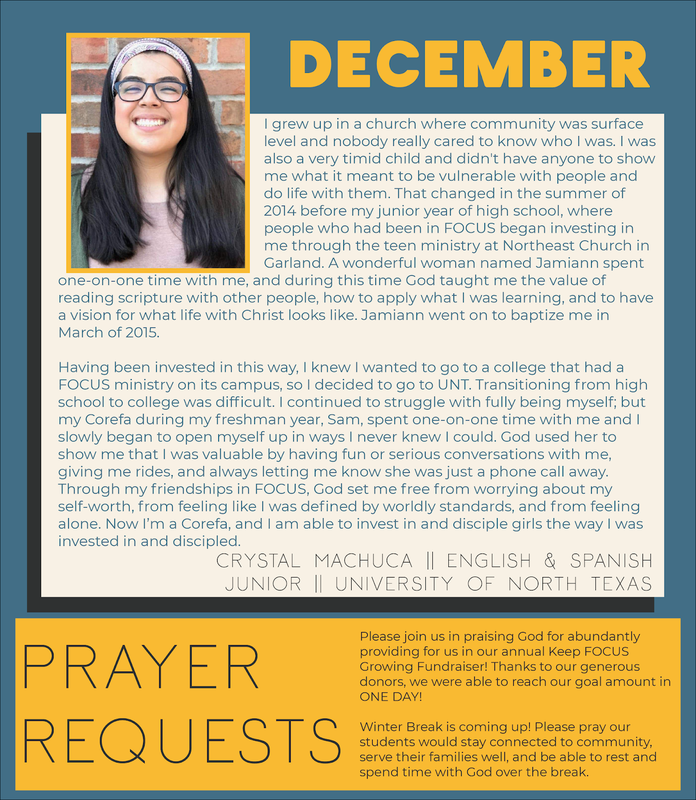 Our student monthly testimony for January! This testimony follows Nicole Jones, a junior involved in our Texas Women's University FOCUS ministry. 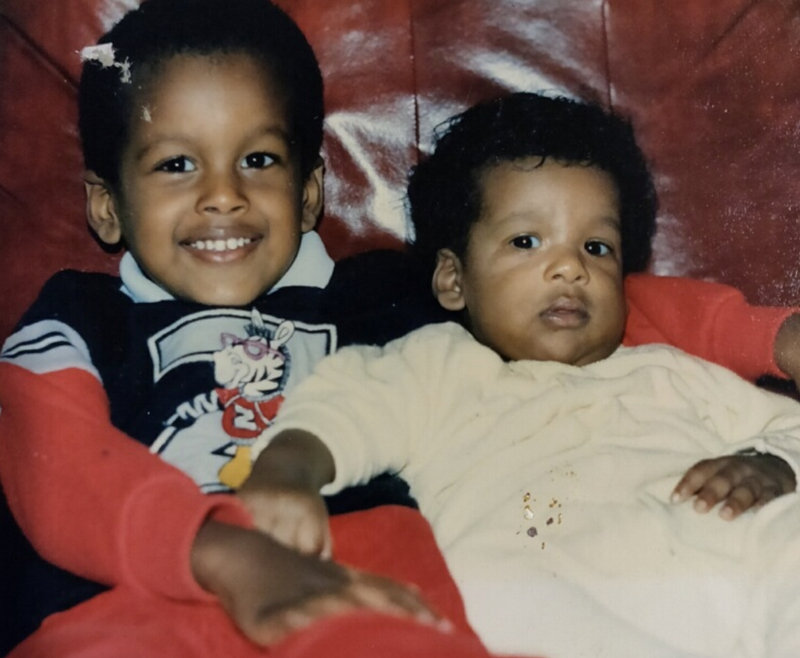 A nice picture of me (right) and my older brother, Menelik (left). At Wintercamp, our students threw a 'Mexican Party' equipped with a Pinata and other festivities! It was a blast :) So many of our students really enjoyed their time together. Tom and his wife, Kristi, came to join us at Wintercamp! Tom is a pastor on staff with CRU and has been a great resource to me & our Richland ministry the past couple of years. Sloan, my wife (far right) was also there! Cheers! 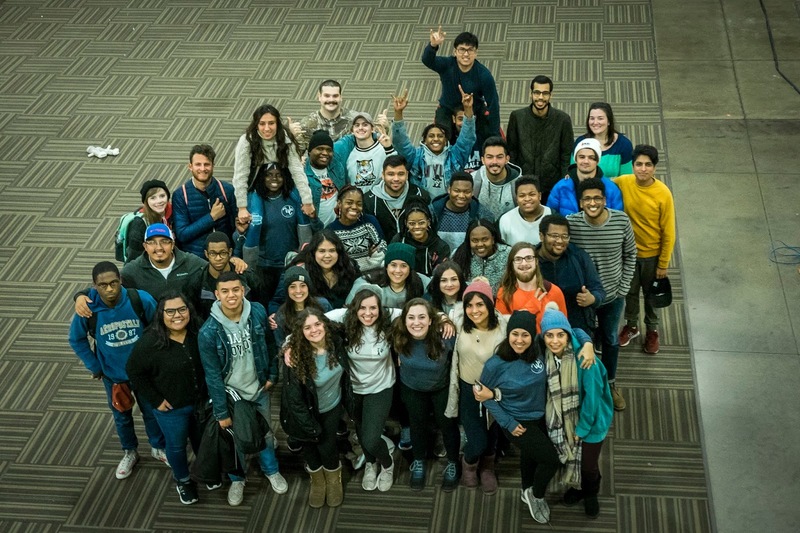 A photo of our entire FOCUS ministry @ Wintercamp! It was a joy to be a part of what God did that weekend! So grateful for all of the students who came that night! I had the privilege and honor to help lead & facilitate worship for our first Thursday Night Thunder! We have our next one on 01/31 - so please be praying for us! Thank you so much for your support and partnership for our FOCUS ministry! We are grateful for your partnership and support. None of this would be possible without you and your belief in making disciples on God's college campuses :) Thank you!!! A photo of our Richland FOCUS ministry! So grateful for these students and their hearts. Our ministry has been a special place where they can know one another and build healthy friendships with each other. Thank you for your support! Thank you again for believing in what we're doing on God's college campuses. It means so much to me that you would support me through prayer and monthly donations. I'm honored to get to serve these students through the gospel of Jesus Christ. Please don't hesitate to contact me with any questions, comments, or concerns that you may have! 2018 Has Come To a Close! So thankful! My friends! My team! How are things?! It's crazy to think that 2019 has arrived and that 2018 is over. Fall 2018 was full of encouraging stories and examples of God's faithfulness. God always provides and takes care of his people. I know that firsthand through an experience I had at the beginning of 2019. On the way to staff retreat last week I was involved in a car accident and my car was totaled (pictures below). I am grateful that nobody was injured and that the cars on the road were driving more slowly than usual due to the weather and road conditions. The accident could have been very bad, however, everyone is fine and I am currently car shopping! If you know of any good deals in the Dallas area, please send them my way! Thank you so much for your support and partnership. Our staff is geared up and ready for our annual FOCUS Wintercamp coming up next week. Our students are excited and have been preparing all year for this. Please be praying for God to move faithfully in touching our students' lives. 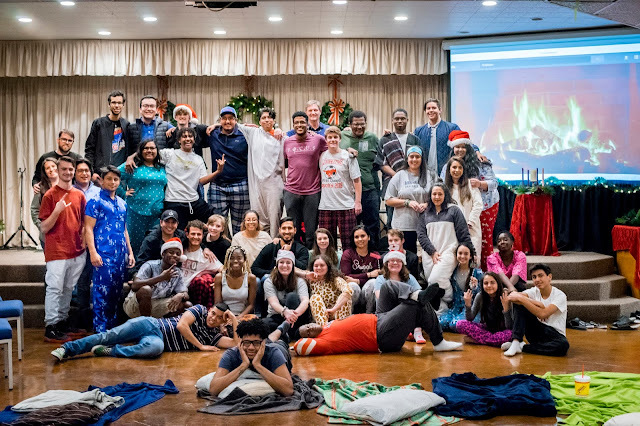 Wintercamp is always a special time of the year. 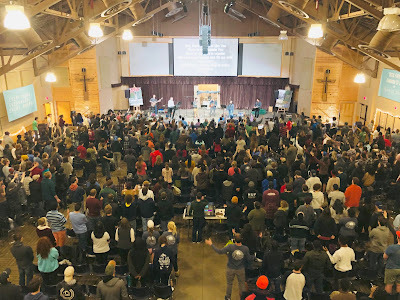 I remember when I was a student how special it was to get to be with other college students and worship God together at Wintercamp. Please be praying for our many student leaders as they invite the students in their core to wintercamp, that God would provide the finances for all students to get to attend wintercamp (we never want money to be a reason why students don't attend camp), and for safe travels! Thank you for your support and I hope that the below pictures are encouraging to you! I cannot do any of this without you. I'm grateful for what God did through your partnership for the Fall 2018 semester and look forward to what the spring holds! Joey, me, Casey, and Ben! I love getting to spend time with these guys every Wednesday to talk through different ways that we can serve & bless the students around us. 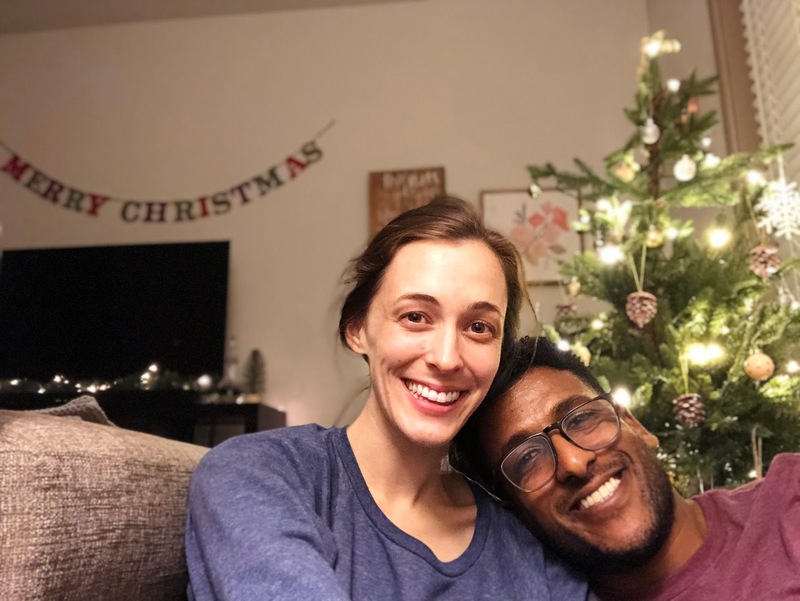 My wife and I celebrated our first Christmas together! Another picture of our Richland FOCUS Christmas party! For our Christmas party, we brought in past alum of Richland FOCUS and they did a great job introducing and celebrating the student leaders in our group. It was a blast! This is a picture shortly before they announced the winner of our core performance competition! Our end-of-the-year FOCUS lunch that we shared together! We spent time sharing how we've seen the people around us go 'all in' for God this year and it was so special to hear from the different people. Another picture of our group that came to our Richland FOCUS end-of-the-year party! 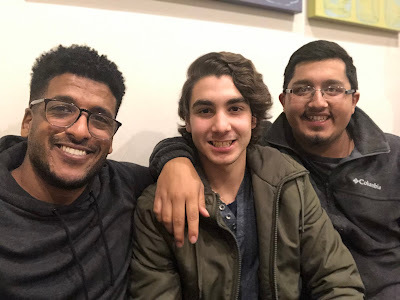 I got to spend time with Roy (center) and Valentine (right) throughout the fall semester. Roy is an international student from Mexico who attended Richland College in the fall. He decided to follow Jesus and has been a consistent part of our ministry. I'm grateful for him and his time here in America. Valentine has also been such a good influence on Roy and they have become the best of friends. We'll miss you Roy! Here is a picture of Roy trying to take a picture with Valentine. I got to attend one (of many) of Sloan's family Christmas events! It was so fun getting to experience what she has a part of her life every year. I enjoyed our time together! Thank you so much for your support and partnership over the years. I hope that 2019 is full of God's provision and awakening in your lives. I am grateful that you would be a part of my team and that you continually are side-by-side with me on campus as we make disciples for God's glory. Please don't hesitate to let me know if there's anything that I can be praying for you about in your life! November was a wonderful month full of celebrations and seeing God at work. I'm so taken aback at how many students are being loved on and discipled at this point in the year. If you're unaware, traditionally, our Richland FOCUS ministry has been anywhere from 5-10 students strong on a year to year basis. This year, our Christmas party brought over 35 students to it! We have traditionally had 2 core small group bible studies, but this year we have 5! God has been so good and faithful to continually build us in size as he grows us from the inside out. Something that I feel that I have been learning has been the idea of being present - in the moment. I remember a couple of years ago, praying for a moment like this: students who are taking Jesus seriously on campus, different core times & availability for bible studies, and solid faculty relationships were all a part of our November. Now that God has provided richly, I feel challenged to be present to the moment and respond with worship and thanksgiving. As a campus pastor, life is fast paced and I can often find myself longing for the past or feeling anxious about the future. Being present has been a prayer of mine as we enter into the break and seek God as our refuge and comfort. For our Richland FOCUS times, we have been having lots of student sharing. One of our corefas, Evan, is sharing with our students what God has been teaching him. A shot from up top of our Friday Night FOCUS gatherings! One of our Friday nights, we shared about phileo love for one another and how to develop the type of love between good friends. Afterward, our students sang "We Are One In The Spirit" - such a great time! For thanksgiving, Valentine, one of our Richland FOCUS student leaders joined me and my family for Thanksgiving! 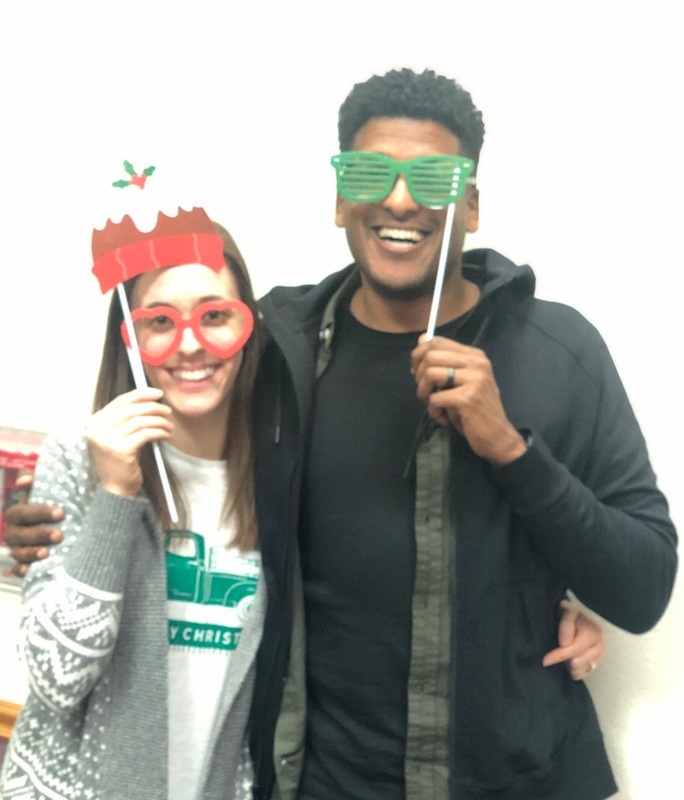 Our Richland FOCUS Christmas party! Our theme was "Christmas Morning" and the student-led small groups each performed to win the prize of a VISA gift card toward a core party! Evan & Jesse's core won! 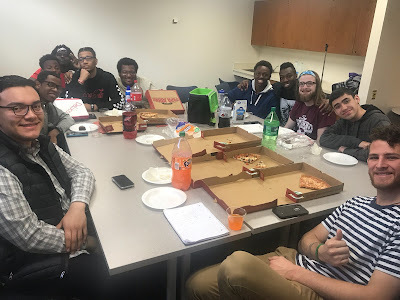 We had an end-of-the-year lunch with all of our students and we each got to share with the group, "How have you seen those around you go 'all in' for God this semester?" It was a joy to hear from them! Another shot of our end-of-the-year lunch! Thank you all so much for your love and support of campus missions :) We are blown away at what God is doing on our campuses and we are grateful that through your support, we get to be side-by-side with our students as God continues to shape and mold his next generation of disciples.